Home › Knowing God › What Should I Pray For? In 1 Thessalonians 5:17, Paul taught the people to “pray without ceasing.” What does this mean? To pray without ceasing is to pray every day and many times a day. If you have a best friend, you want to talk with them many times during the day. God wants us to talk with Him many times during the day as well. These prayers do not have to be long. We may pause to pray for a minute or two but it is precious time spent with God. We can share with God the good and bad things that are happening that day and ask for His help. He always listens to His children. Make prayer your daily habit. You can find many things to talk with Him about if you just take the time. But you may ask, “What should I pray for?” The Bible gives us that answer. When you pray, it is good to pray that you, your loved ones, and other faithful people will be in good health. In 3 John 2, John said that he prayed that Gaius would be in good health. We certainly do not want the people we love to suffer because of illness; however, there are other reasons to pray for someone’s health. If a person is healthy they can do some things in service to Christ much better. When I am sick it is hard to prepare lessons and a sore throat makes it almost impossible to preach. We pray for the good health of those who work in the church so that they can continue in their service to God. Pray also for your own good health and, whether you are sick or healthy, do the best you can do in service to God. When God established the church he also gave the elders the responsibility to oversee, or rule, over the church. The elders are like shepherds who take care of sheep; the elders help feed us spiritually by making sure the teachers and preachers are teaching the truth. They make sure that your Bible classes are planned well and that the teachers are presenting lessons that will help you grow in your Bible knowledge. They also help people in the church who are having problems by talking with them and giving them advice from the Bible. They must be wise about how to handle problems and using the Bible to help people know what they are supposed to do. Does your church have elders? Do you know who they are? If not, ask your parents to tell you who they are. Pray for them and their important work in the church. Thank them for their important work as well. As a preacher, I am so glad to hear when people pray for me as I am ready to preach. I want to make sure that I do not teach false things and that I teach the good things well. When people pray for me, I know that they want God to help me do what is right. When you pray, be sure to pray for your Bible class teachers and your preacher. Both spend a lot of time during the week preparing classes and sermons to help you grow because they love the Lord and they love you and want you to go to heaven. God warned teachers that they would be judged even harder by God because they might lead people away from Him if they teach false things, James 3:1 Pray that they may always speak the truth. Pray that they may be able to teach their lessons in a way that others can easily understand the important message of God. 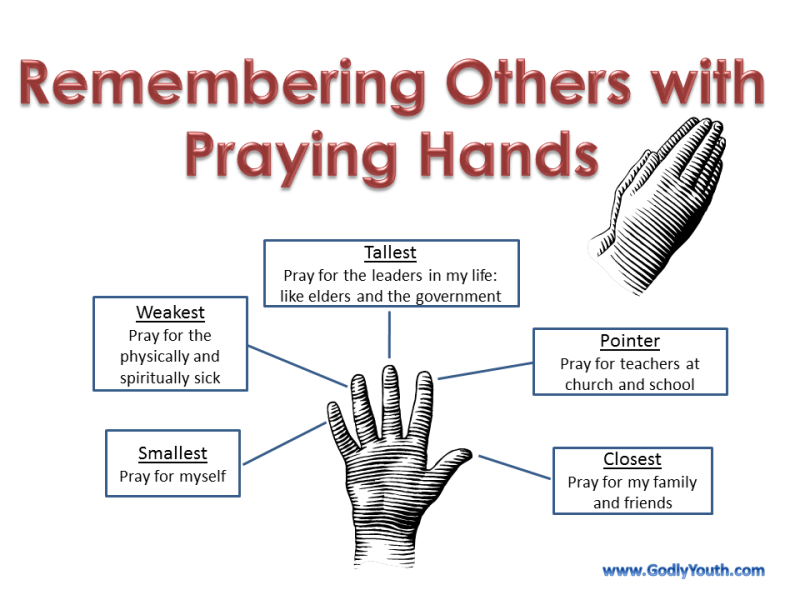 How I was taught to remember others when praying. When you pray, be sure to pray for your parents. They will appreciate you asking God to help them. As a parent I want my children to pray for me to be in good health. I want them to pray for me to do well in my work and that we will have the things that we need, such as food and clothes. I also want my children to pray for me to be a good father and for my wife to be a good mother. We have never been parents before so we want God’s help. We want our children to pray that we will be wise in our decisions and to forgive us when we make wrong decisions. I want my children to pray that I will be a good example to them. I also want my children to pray that I will give them my attention and love; that when I punish them I will be fair and understanding. Be sure to pray for your parents. Do not forget to pray for them every day. If you listen to the news or study current events in school, you know that there is trouble with different nations in the world. The government has to protect us from terrorists as well as protect many of our rights. Government leaders have many great responsibilities and the Bible tells us to pray for them, 1 Timothy 2:2. We should pray that they make decisions that allow us to live as Christians without persecution from the government or any other person. We should also pray for the leaders of the world governments that they would allow their people to worship God freely; not all people enjoy our freedom to worship God as He commanded. We should also pray that God will give them wisdom in their many difficult decisions. We should pray that they will decide the things that will bring peace, not war. If we have to go to war, we pray that the war will end quickly with few deaths. We should pray for them to make decisions that will benefit all people and allow them to live right. James 1:5 encourages his readers to pray to God for wisdom: If any of you lacks wisdom, let him ask of God, who gives to all liberally and without reproach, and it will be given to him. Godly wisdom is one of the most important things that we can have. Godly wisdom helps us make good decisions and avoid things that we should not do. We get knowledge by studying God’s word. Wisdom is the ability to use what we have learned from God’s word. Study for knowledge; pray and learn from godly people to receive wisdom. Pay attention to what your teachers, the preacher, and your parents try to teach you from God’s word. Use what you have learned to make good decisions and avoid things that displease God and will do you harm. Pray for wisdom and trust God’s promise to give it to you. Every day each of us has to make good choices. Friends at school, in our neighborhoods, and even friends from church ask us to do things and to go places. We must make good decisions about what is right to do and what we should avoid. We should also pray for the courage to explain to others why they should not do things that are wrong. You can teach them this way. You become stronger when you make good choices. In Hebrews 5:14, the writer compares it to exercising. When you exercise your muscles you become stronger. When you exercise good decision making, it is easier to choose the good in the future. Even your parents have to make good choices. Pray for them to make good choices as they try to raise you. They are probably praying to God for the same thing. You will pray for good choices all of your life. In the model prayer of Matthew 6:13, Jesus told His followers to pray that they would not be led into temptation and that, when tempted, they would be delivered. Through bad choices, some people find themselves tempted when, if they had made better decisions, would not have been tempted. If you hang around people who do things that you know are not right, you will likely find yourself in a situation that you could have avoided. We should pray to God for wise judgment to avoid temptation. It is not always possible to avoid temptation so we should also pray that God would help us in temptation. In 1 Corinthians 10:13, God promised that with each temptation He will provide a way to escape evil. We must pray to God for the wisdom to see the way of escape and the courage to take it. Since Satan is our enemy, we need to pray for God’s help. In John 8, Jesus used the example of harvesters in a field to tell His apostles to pray for teachers to lead people to Him. The lost need to hear the gospel. You may not feel like you could teach someone but you can lead that person to a teacher or invite them to Bible class or worship services where they can hear God’s word taught. Pray for chances and the courage to invite friends to Bible classes, gospel meetings, Vacation Bible School, and worship services. By leading someone to Jesus you can change their lives for the good and they can have eternal life with God. Which of your friends or family members needs to hear the gospel? Pray for them and try to find opportunities to teach them or lead them to a teacher. We should develop a habit of thanking God for our food. Paul taught that we should give thanks to God for the food we eat, 1 Timothy 4:3-5. Jesus taught His disciples to thank God for their daily bread, Matthew 6:11. The wise wife quietly reminded her husband that it was by God’s hand that he had his job and the health to do it. God also gave the rain, the sunshine, the seed, and allowed the plants to grow and bear fruit. God provided the nourishment for the animals and the lives of the animals themselves. Last of all, He provided the rain that, in a pure form, filled their water glasses. The father saw her wisdom and humbly thanked God for the food He had given. Consider some of the the different things for which we should pray already discussed. When we pray, we must also give God thanks for the prayers He has answered and that He listens to us. Though some adults may ignore you when they are busy or at other times, God always has time for us. He wants us to visit Him in prayer and open our hearts to Him. However, we should not just spend our time asking things from Him. We would not like it if people only talked to us when they wanted something we had. Luke 17:11-19 records the story of ten men with a terrible, incurable disease called leprosy. These people had to stay away from all healthy people. They cried to Jesus, asking Him to heal them. He told them to go to the priest who could determine if they were healthy. As they went, they were healed, but only one returned to thank Jesus for what He did. Let us remember to give thanks for all that God does for us and the care that we enjoy. Let us not be unthankful. Do you ever wonder why we often say, “in Jesus’ name” at the ending of prayers (or something similar)? This verse helps us understand why. We approach our Father through Jesus. He is an intercessor (pronounced: enter-says-her). An intercessor is one who asks something on behalf of another person. When we pray to the Father, Jesus is on our side. We must give thanks for all things because all things come from God. Every blessing comes from God (James 1:17). If you spent a lot of money or a lot of time on a gift for someone and they acted as if they did not care you would feel hurt, perhaps even angry. We are ungrateful if we do not give thanks for all things that God has given. We give thanks for the good things we enjoy for we are very blessed. We should even give thanks for some bad things. If we are tempted but we do not sin, we become stronger. When we are sick, we appreciate our health. When we have bad days, we appreciate the good days. In all things, we must give thanks to God. We can only approach the Father through Jesus; therefore, we must do all things in His name. ‹ Could You Serve Christ in Obscurity?